Strategy Inputs: VIX and VIX futures (to establish if VIX term structure is in Contango or Backwardation) and XIV/VXX/SPY prices (to establish response of trade-able instruments to VIX term structure). 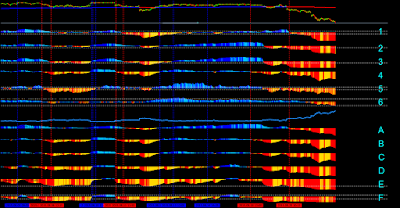 These inputs are evaluated using 5 minute bar data. If strategy survives the real time test its details will be made available. Execution: Strategy moves from one vehicle to another in three 3 steps. At each step 1/3 of previous position is moved to the opposite vehicle e.g if it was 100% in XIV, on first signal it moves 1/3 of that position to VXX ,and so forth and so on. 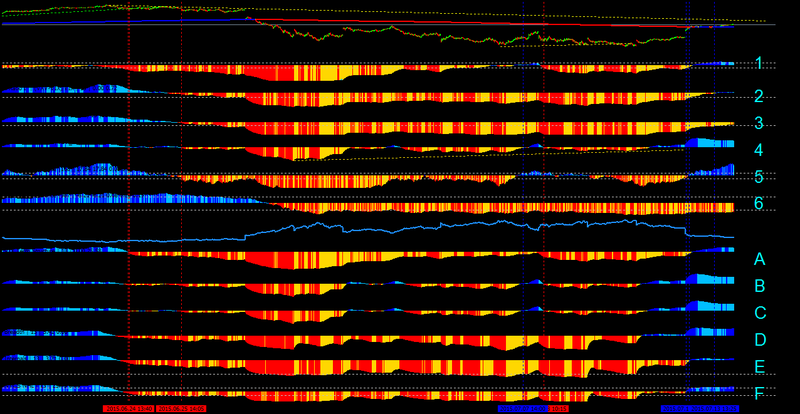 Signal is acted upon on 10-12 bar after materializing thus giving enough time for the execution. During this test I will attempt to post each signal (if not near their arrival) by the end of the day for sure. The system switched the side; it is now 100% in XIV. This is a good time to review the last switch (trade). System moved to 100% VXX on June 24, 2015, average price paid was $17.26. Today this position was liquidated at an average price of 18.11, realizing a gain of 4.75%. Draw down since entry was 0%. While net realized gain is < 5%, the position (while in trade) had unrealized profit of (as high as) 24.5%. Looking back, this is a typical behavior of this system; realized profit is much less than maximum excursion. Some improvement that allows taking advantage of this wasted excursion is highly desired. Additionally, Here I show you a strip down version of the setup & a strategy to act on the signals generated by this setup. System moves from one vehicle to the opposite in three 3 steps. -First Step: When at least 5 indicators move from one side to the other. 10 out of 12 indicators move from one side to the other. -At each step 1/3 of previous position is moved to the opposite vehicle e.g. if it was 100% in XIV, on first signal it moves 1/3 of that position to VXX/UVXY, and so forth and so on. -Signal is acted upon on 10-12 bars after materializing thus giving enough time for the execution. The system switched the sides on Jul 24; it is now 100% in VXX. Here is the review of last switch (trade). System induced a partial switch on Jul 17. While this was in effect, 3 R/T using UVXY added 4.8% to the portfolio. Had I kept the UVXY since first entry it will have an unrealized gain of 4.8%. Though R/T execution is not part of the original design, but it is a cool feature. First, as soon as this feature is enacted portfolio goes to market neutral (almost, considering there is some negative effective due to decay factor plus the management fee of the ETNs). Secondly, it allows taking advantage of wild moves in UVXY that usually occur when the systems is nearing a turning point. To identify exit/entry points, I use support/resistance and trend line analysis with a reasonable success. Maximum excursion (in XIV) while in this trade was 12.8% and total realized gain till the complete switch was 12.1%. Considering, last time while in VXX, system could only fetch ~4% of the ~24%, this deserves some celebrations!!! Note: I make every effort to report all performance figures as accurately as possible but individual figures are prone to some inaccuracies. However, "Total gain/loss" is least impacted by these inaccuracies, as it is based on total portfolio value. The system switched the sides on August 18/20; it is now 100% in VXX. Here is the review of system performance since Jul 29, 2015. From Jul 29 till August 18, system experienced lots of turbulence and gave back all profits and some more. At the low point on August 19, system was down -3.2%. This was a period in which XIV/VXX traded in a narrow range; system is known to perform poorly in choppy markets. However, system was well placed to capture gains in VXX (as these materialized in the last two trading days). System is now up 20% since inception. Here is the visual of this setup. Note this visual is updated on my blog more frequently than here. August 23, 2015: Current VXX spike is the 4th highest since 2009, I will take profit on 1/2 position and set a trailing stop of 5% for the second half. This will override the technical setup. There hasn't been much action in this strategy since it last exited VXX on 8/24, almost near its top. Though there were few attempts to go Long XIV but didn't add much to the bottom line.